Imagine you are on a cruise and take care of your baby. What comes to your mind most likely to pass your time? Exactly, free drinks and a slot machine, doesn't it? 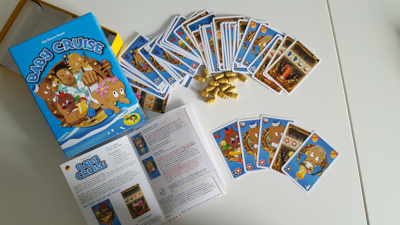 JUMPING TURTLE GAMES, a small Belgian publisher and the successful creators of Baby Blues, once again send us in their baby universum in their proven style. As the name of the game implies, everything revolves around the offspring. The babies can help you win, but they can also get you in trouble. 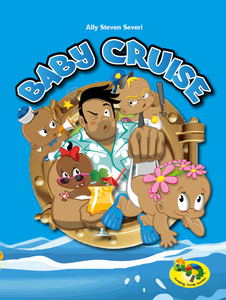 The goal of Baby Cruise is to decide the round by collecting same symbols in your hand. It is a pure card game with a lot of babies and so-called jackpot cards. At the set-up, the deck of baby cards is placed face down on the table, each player draws a card, then the oldest one starts. On their turn the players draw a new card, show this card to all other players and passes it to another player again. After each round, the players check if one of them has won. If there is no winner, the player who received the card is the next player in turn. So there is no fixed order, because players can freely choose the recipient of the card. On the baby cards you can find cocktails, fruits, poker chips and of course the babies, on most cards several of these symbols. It is the aim of every player to collect three matching fruits, because this wins the game. But of course this is not too easy, because you only get new cards from the other players. So you need luck and a lot of bluffing to get the right cards. The babies have different characteristics: . 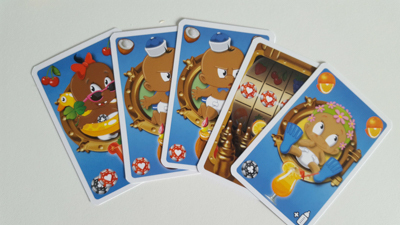 When a player receives the lucky baby, he also gets poker chips that you can use for the jackpot, the captain baby forces a player to give one of his hand cards to another player and the shy baby is automatically passed on to the player with the fewest cards. If you have collected cards with symbols of three of the same cocktails, you get seasick, as we all are on a boat (that`s why the game is called Baby Cruise. Of course, you are handicapped after that, but you may keep it secret unless the police baby finds out. So getting drunk is not too bad immediately. But if someone else gives you the police baby, you must show all your cards and if at that moment you still have the three equal cocktails, you are arrested and the player who passed the card to you wins the round. So you see, it is very important to remember who got which card in the rounds before. While the police baby can be dangerous for a player, a jackpot is something positive. Receiving this card, gives you an additional chance to win the game, if you have the right combination of fruits and poker chips already. If more than one round is played, golden milk bottles are used to keep track on the victory points. The winner of a round will receive one or more bottles depending on the cards in his hand. When all bottles are gone, the player with the most milk bottles wins. Up to now, we only had the chance to play Baby Cruise several times with three people, giving us a good overview of the cards. Although it played well, I think the game will certainly be more interesting when more players are participating. Compared to Baby Blues the baby theme was implemented slighly weaker, but still it felt very nice and makes you want to have more (perhaps Baby Blues, if you don't have it yet). And if, after that, you have an insatiable demand on baby games, you might be lucky, because I heard that JUMPING TURTLE GAMES wants to publish one baby game per year... Anyhow, Baby Blues is quickly explained and is well suited for an unusual filler. 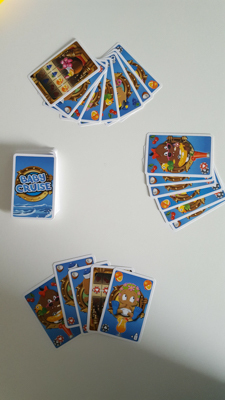 To sum up, I think that Baby Cruise is a funny card game for three to six players and defenetly not only for expectant parents.